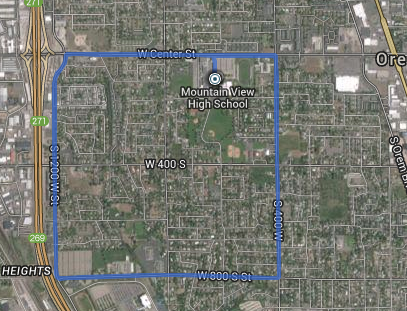 The transition area will be located in the grassy area between Mountain View High School and Orem Fitness Center. Bike- 12 miles (3 loops) This is an open course; cars will be driving alongside you. 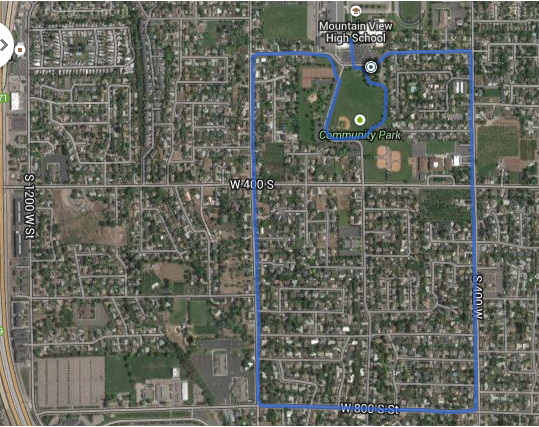 Orem PD will be located at all 4-way stops and lights along the course. This does not mean that you should blow through the intersection. Please use caution as Orem PD will do their best to keep you safe. There is one hill that you will hit 3 times on the bike course. It along Center street from 1200w to 800w. Once you hit that hill for the third time you know you'll be heading into to transition to swim. Swim- 350 meters in the Orem Fitness Center indoor pool. Transition area- In the image below you can see the transition area is located right where it says Mountain View High School. The race parking is the upper parking lot, right along Center Street. It is strongly encouraged that you pick your packet up Thursday or Friday prior to race day to save time and help minimize big lines the morning of race day. Enter to win T3 Goodie Bag if you pick up your packet in the shop prior to race day. The transition area will open for athletes at 7:15-8:30. Same day packet pick up will be available starting at 7:00 am. However, it is strongly encouraged to pick up your packet prior to race day at T3 Endurance Sports(T3 Triathlon) in Orem. This is a timed race and all athletes will need to pick up their timing chip on race day at the start of the race. Body marking will be available the morning of the race at packet pick up area. Portapotties will be available near the transition area. Orem Fitness Center members are welcome to use the facilities prior to the race start. All other racers will not be able to use the Fitness center facilities until after the start of the race. Spectators will not be allowed in the transition area nor the pool area. However, there is an observation deck in the Orem Fitness Center. Access the observation deck from the main entrance of the Fitness Center. Spectators will not be allowed on the pool level. 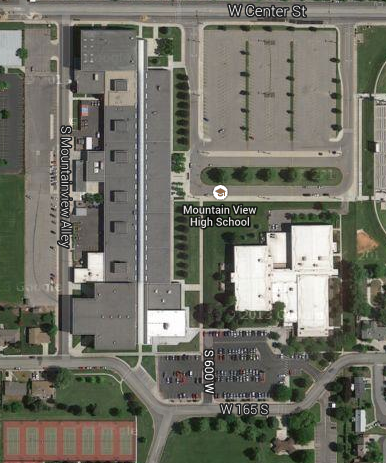 Parking will be available at Mountain View High School off of Center Street in Orem. Post race food including bagels, oranges, bananas, Swedish fish, trail mix, water, will be available for all athletes. Stick around for the awards! You won’t want to miss your moment on the podium! We also have some cool gifts to raffle off from some of our sponsors! Age group award will be announced at approximately 10:30 am.